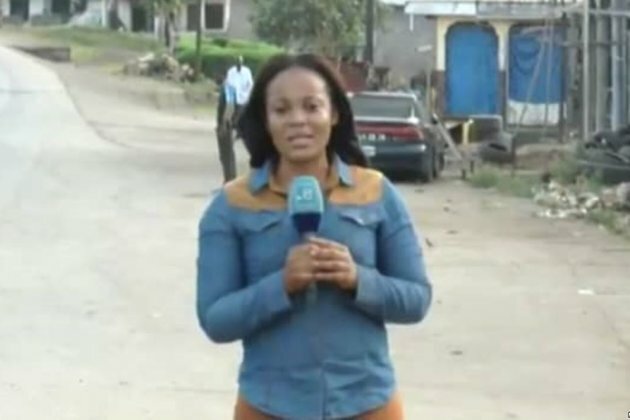 YAOUNDE, CAMEROON - A popular journalist from Cameroon's restive Anglophone region remains in jail after she was arrested and charged with propagating false information and terrorism. Media rights groups say the arrest of Equinoxe broadcast journalist Mimi Mefo is an attempt to silence outlets that report on the crisis in that region. Mefo's lawyer, Alice Nkon, said her client was taken to a prison called New Bell around midnight Wednesday, some 10 hours after she showed up as requested at a gendarmerie station in Cameroon's economic capital, Douala. Mefo had opted for the right to remain silent after gendarmerie officials accused her of reporting false information, Nkon said. According to Nkon, the gendarmerie were referring to a report in which Mefo said bullets found in bodies of civilians killed in violence came from the regular army, not armed separatists, as the military had alleged. Nkon said the gendarmes also presented screen shots of Mefo's Facebook pages and accused her client of cybercrimes, saying that most of what was published constituted an attack on state security. Libom Li Likeng, Cameroon's telecommunication's minister, says the law provides for several sanctions, including prison sentences of up to two years for people guilty of using social media to propagate false information. She says the propagation of such information on social media is punishable by six months to two years in prison and a fine ranging from $8,000 to $16,000. She says her ministry has cybersurveillance equipment and will be proposing additional texts to the law on cybercriminality. Other journalists who have been detained for several weeks in Cameroon include Michel Biem Tong, known for being highly critical of executions he alleges are committed by the military fighting the Boko Haram insurgency and crisis in the English-speaking regions. He was arrested October 23. Gustave Flaubert Kengne, publisher of Orientation Hebdo that specializes in reporting human rights abuses, was arrested in the western town of Bafoussam on October 29, just after Joseph Olinga of Le Jour newspaper was arrested. The Anglophone community in Cameroon is protesting political and economic discrimination in the majority French-speaking country. In June, a report by international human rights group Amnesty International criticized both the military and separatists for using unnecessary and excessive force. Amnesty said civilians frequently were caught up in the violence. The government criticized the report as biased and stated that its military was professional. FILE - Students, their principal and school staff were kidnapped from the Presbyterian School of Science and Technology in Bafut, near Bamenda, Cameroon, Nov. 5, 2018. On Tuesday, the U.S. State Department issued a statement condemning the kidnapping of dozens of students and staff in Cameroon's restive northwest region. The 79 students who were abducted from their school along with their principal have been freed. Three school staffers kidnapped with the students were still being held captive. The statement also made note of the death of American missionary Charles Wesco in the Anglophone crisis. The governor of the northwest region of Cameroon, Deben Tchoffo, says he has called on the administration and soldiers to look for the remaining staff, but he is counting on the collaboration of the population. The governor says the administration, traditional rulers, and elite and local council authorities have been mobilized to work with the population and ensure that all those abducted are freed, the kidnappings are stopped and peace returns. He says he is appealing to all youth who have taken up weapons against their people and the state to repent, warning that otherwise the military will kill them.